© Copyright Tai Chi Productions 2007, revised 2012. All rights reserved, no part of this article may be reproduced in any forms or by any means, without permission in writing, except for non-profit educational purpose. For example: you can photocopy this article for a paying student or participant as long as this article is not included as part of your charge. Once you have a good foundation in tai chi, you must continue to progress in order to gain more enjoyment and greater health benefit. You can do this in several ways; continue to improve what you’ve already learned, or venture out and learn a new set of forms or a new style. For some, however, learning a more complicated set of tai chi forms may provide more enjoyment and a greater sense of achievement. 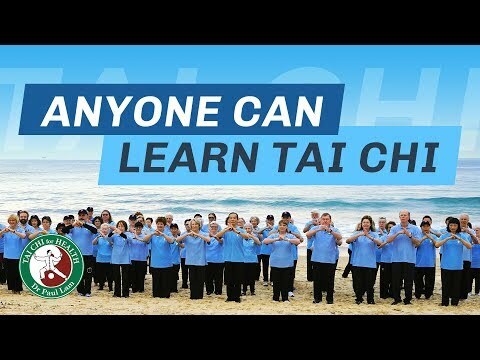 Just remember that tai chi is an art, not a sport in which you move up through some arbitrary grading system, nor a competition where somebody wins and somebody loses (though there are tai chi competitions). The real reward in practicing tai chi is intrinsic, giving you a sense of personal fulfillment as well as enjoyment and better health. Sun style and one of the greatest tai chi masters in history, said that the highest level of tai chi is not being invincible, but is in understanding the Dao. The Dao is nature. Practitioners reach the highest level of tai chi when they are in harmony within themselves and with nature. So at a high level, the internal component matters most. What is the right way to do tai chi? Often, tai chi beginners ask ”Is there only one right way?” If you lived back in the old days, you may have spent years seeking out the ‘one best teacher’. Once found, you would have totally devoted yourself to studying under that person, thereby creating a bond of absolute faith in this teacher. As a result, you would believe you knew the right way, as it would have consisted of whatever was said or done by this teacher—your ‘one best teacher’. It’s lucky that we can’t go back in time, as experience shows there is no such a thing as one best teacher or one right way. Too often limited exposure ends with limited ability. I believe that the ancients would have loved to have the chance to be exposed to different styles and teachers, as we can today. For, in doing so, each individual has a better chance to see what will work best for him or her. Today there is no need to spend a lifetime devoted to a single path, only to find out later it wasn’t the right one. Instead, we can learn different styles and interpretations, thus shortening our path to a higher level. Let me touch on a few of these differences in styles and interpretation. Different styles have different ways of moving the feet. For example, in Yang style, you move forward and backward by lifting your foot slightly off the ground and touching down like a cat. In Chen style, you step forward by lifting your foot higher and brushing the heel along the ground. Different styles can also have different hand shapes. Yang style uses an open palm, while Chen uses a closed one. “Depress the chest and raise the upper back.” This is one of the 10 essential points listed by Yang Chen-fu, one of the most famous tai chi masters in history. What does that mean? Different styles hold different interpretations. To many, it means relaxing the chest and allowing your qi to reach your back, but where most Chen stylists don’t hunch their backs, many Yang stylists do. Why?, because Yang stylists interpret “raising the upper back” to mean hunch the back. Even, within one style, you can encounter many variations within movements. For, as individuals practice, they might find they like a particular interpretation of a hand or foot movement, which then is incorporated into their teaching. As a result, you may see all kinds of variations of the movements within a set form. My point, minor differences aren’t important. Thus, there often isn’t one “right” way to do a tai chi movement. The important thing is to understand and integrate the essential principles of tai chi. For all styles of tai chi follow the same essential principles.